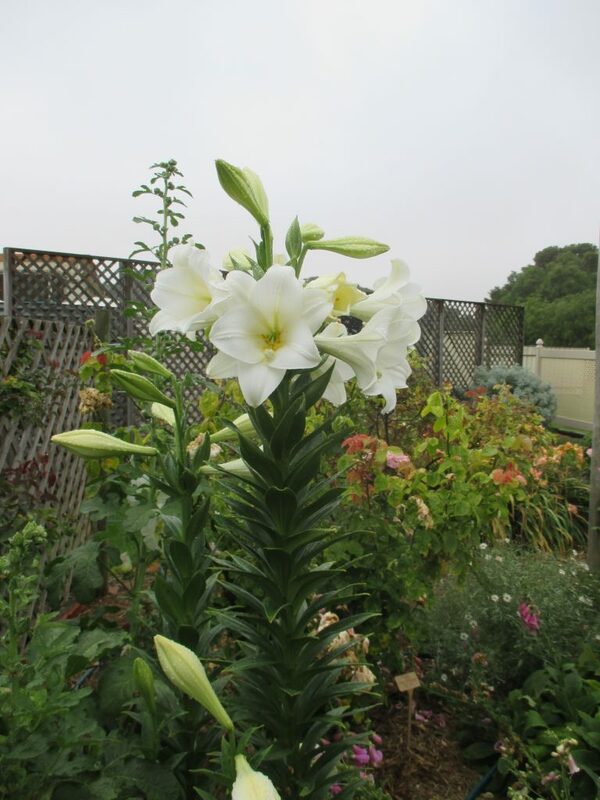 One of wonders of the garden world in the Southern Hemisphere is the white Christmas Lily or Lilium Longiflorum. Those pictured are growing in our Rose Garden and are very tall, with a wonderful perfume. I cut one branch several days ago and brought it inside to enjoy, away from the galeforce wind. It’s still looking perfect and its perfume has been wondrous. I remember my mother used to tell me of the Christmas lilies of her childhood – she lived in Williamstown in the Adelaide Hills and there was a steep path down from the front of house to the street below. Along both sides of the path, she remembered, a profusion of white Christmas lilies would flower in December. In later life, she always had some in her own garden, to remind her of her childhood. And that’s one of the most magical things about gardens – they way certain special plants evoke our treasured memories of the past. The lilies are quite easy to grow. I planted the bulbs in a sheltered part of the Rose Garden, behind a trellis. There, they were in good soil which was mulched with pea straw and watered regularly. Through spring, there was the excitement of seeing the tall stalks forming and then the buds, filled with promise. When the flowering is over, the bulbs will become dormant until they awaken next year, in time for us to enjoy their beauty during the Festive Season.